Because it’s such an amazing park! It’s relatively small, but its fascinating canyon, wild green river and red cliffs make it unique and unforgettable. 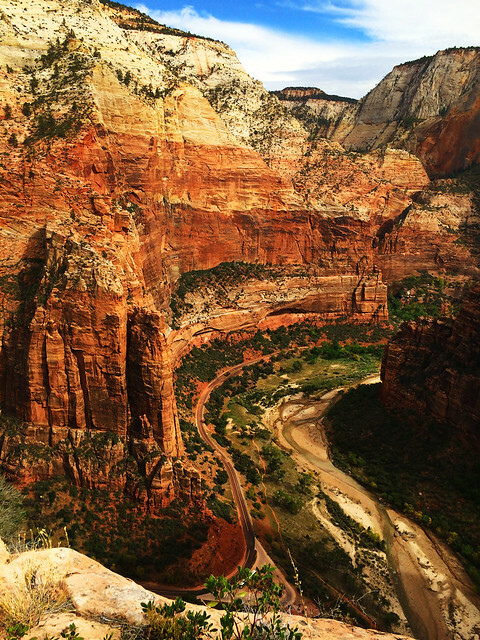 Oh, and its extreme hike: Angels Landing! 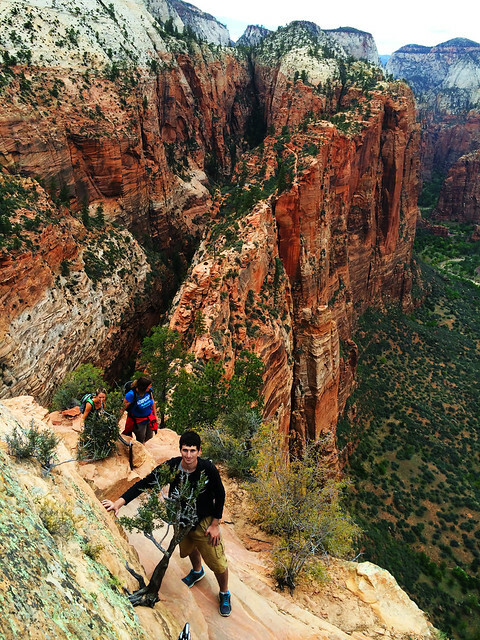 Angels Landing was one of our most challenging hikes and maybe I’m not too badly mistaken to say that it’s also one of the most extremes in North America. I mean the most extreme of those which doesn’t require special climbing equipment. But there’s another thing which makes it very special: the 360 degrees astonishing panorama! 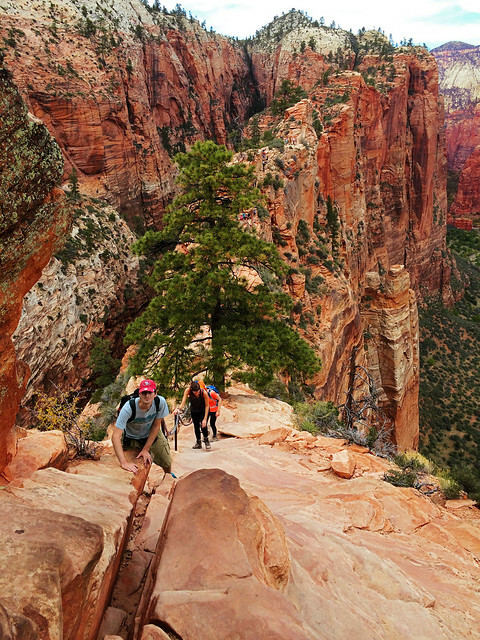 The trail leading to Angels Landing is actually called West Rim Trail and it’s located in Zion Canyon which is in the central area of the national park. Yes, it is. But life itself is also dangerous. 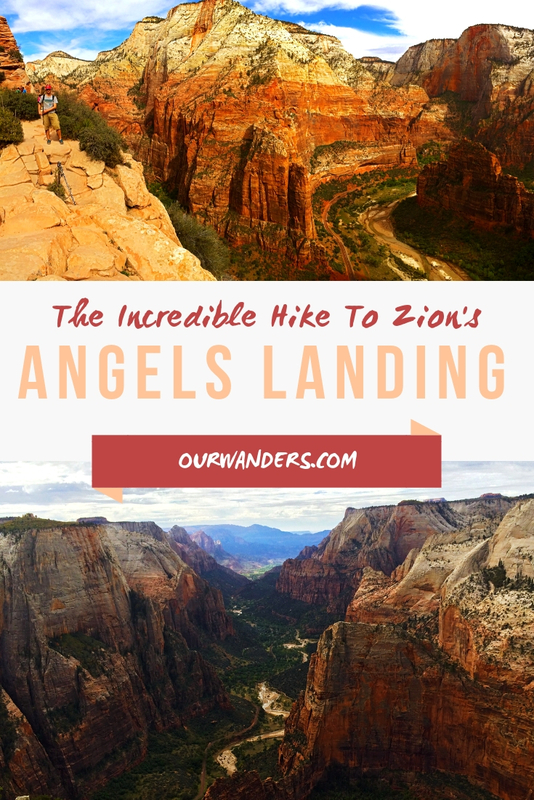 We’ve read a lot about this hike prior to our visit to Zion and several articles made us so horrified that we almost skipped it. We are so happy we haven’t! But of course, it’s your choice and your responsibility. What you need to know is that the last section (right behind me in the above picture) is a very steep and narrow ridge to the summit. Sometimes you are just one step from the edge and you are really high. So it’s not for anyone fearful of heights! If you maintain 3-point contact and use the chains wherever they are provided, it should be okay and you can feel safe. Please be mindful of other hikers, too, it’s a busy trail and it’s very narrow. Impatient people trying to pass each other on the narrowest parts of the spine was the scariest part for us. And of course, it’s not a hike for small children, don’t hike in flip-flops, don’t go if you feel dizzy, have enough water and all that obvious rules of hiking… Every hike is dangerous for those who are careless and irresponsible, this one especially. What if you are fearful of heights? That doesn’t mean you should stay away from this hike entirely, but you better skip the last section. The hike up to Scout’s Landing (a plateau before the last half mile) is steep, but it’s wide and you are not that high. Still, the view is beautiful! On the other hand, it’s always you who should decide. Csaba has a moderate fear of heights and still he made it to the top. But if you feel unsafe at any point, you better turn back. 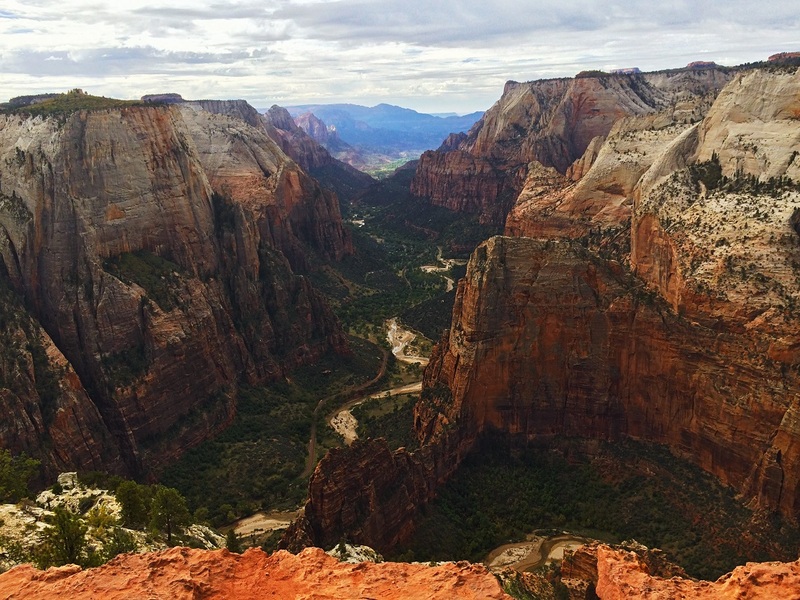 In the high season Zion Canyon is only accessible by the park shuttle. Shuttle service is included in the entrance fee and there’s huge parking lots for you to leave your car before the canyon entrance. There’s too much cars in this small park, that’s the simple reason for closing the canyon to general traffic during high season. But the shuttle operates quite frequently and honestly, it’s much more comfortable to use the shuttle instead of all the hassle with parking at the busy trailheads anyway. It’s only an addition that bus drivers were super kind and helpful in general, they told us about the park and informed us about the trails starting at each shuttle stop. 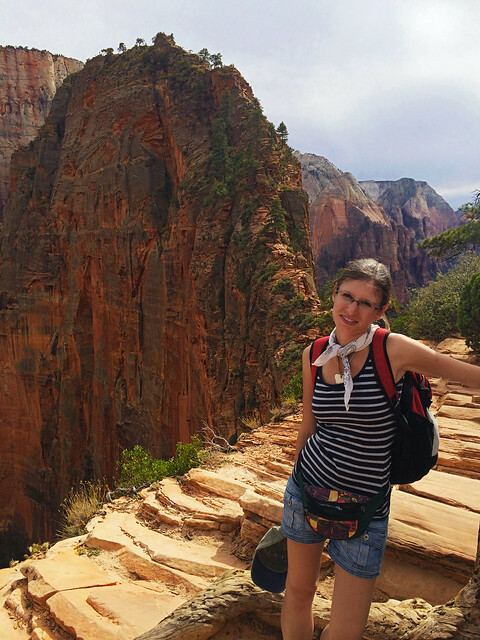 The best time to visit Zion is September-October when summer thunderstorms are over, but the weather is still sunny and dry and temperature is not too cool yet (mornings and evenings are chilly though). Detailed road maps and other useful details (like current road and weather conditions) are available on Zion’s NPS homepage. Would you do this hike? 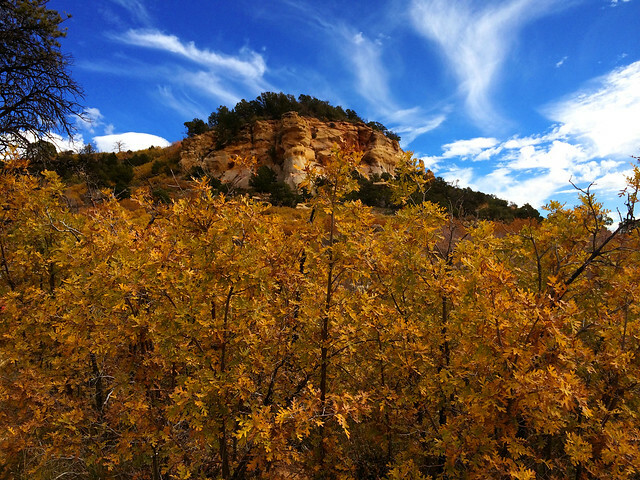 Do you have any other favorite challenging hike? Great blog – takes me back 20 years. I couldn’t get past my fear on this hike and my husband still has nightmares as he tried to conquer the final stretch. A magnificent hike. The Pictures are breathtaking. How Long did the hike take you guys? I get goosebumps just looking at the right cliffside falling off. What an adventure! Thanks, Susanne! Uhm… maybe it took us 4-5 hours altogether. It’s not long, just steep. 🙂 And if it gets busy later in the day that also slows people down as it’s truly narrow in the last section (= one way traffic). Definitely a challenge, but it was so worth it!